Marc Holstein is one of the most interesting guys we’ve had the pleasure of meeting. The backstory of his bike and how it led him on his current journey makes us want to get out there and tinker with our own just so we can get on his level! Back when he was a teenager, he recalls how the very first time he heard his friend’s Commando engine, he knew then that was what he wanted; “When I was 16 I had a friend who just purchased an old commando and ever since I heard the sound I wanted to have one myself”. This passion has only grown, with the Commando still being his prized possession all these years later. It is also the centre of much of his restorations, but more on this later. “I got my Norton about 6 years ago”, recalls Marc, “I restored the bike as a rolling restoration project over the years and it has been evolving ever since”. This dedication to his craft has seen Marc go on a journey every gear head aspires to be a part of. He has been able to restore his pride and joy to its original glory whilst putting his own spin on things. He has also been able to travel the world, using it as his muse doing what he loves doing most - custom and vintage motorcycle shoots. After falling in love with the Norton at the tender age of 16 and finally taking the plunge 6 years ago, Marc has been on a whirlwind of a journey. 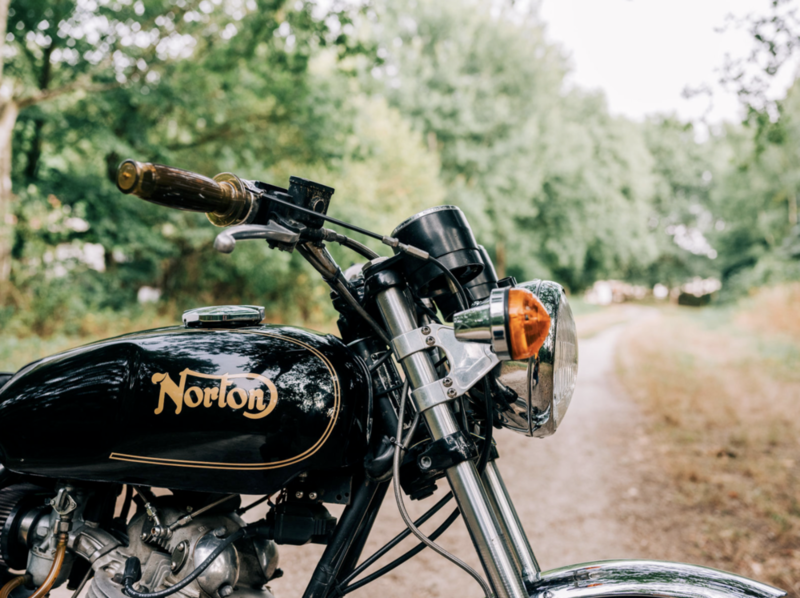 He has been slowly restoring his prized possession with the sort of care and precision you’d expect from such a dedicated collector; “The bike has an electronic ignition, Upgraded Shocks, and various parts from Colorado Norton works. I also found a second hand tank recently that I am planning to paint in an original vintage Norton metal flake colour”. After snapping pictures of his newly restored beauty, Marc realised his true passion lay with photography; “my love for motorcycles has actually brought me to start shooting bikes…this has grown into a business in which I am doing it professionally”. He now uses both of his loves in tandem for his business endeavours and like with all good gear heads, whenever he needs inspiration…he just goes for a ride. Moving forward, Marc has big plans. As his business is showing no signs of stopping in its fantastic growth, he is going to continue with travelling, taking his custom builds to race tracks; “the bike has already been to a racetrack in Paris…and I am planning to take it again this year”, restoring his Norton and pursuing his real passion - photography, even further, with collaborations lined up throughout the year. A big thank you to Marc for taking the time to showcase his fantastic Norton Commando 850 to us and for taking us through his journey so far. I’m sure we’ll be seeing a lot more from him very soon. You can keep up with him on his blog and Instagram too.